Rena combines two key roles within her current professional portfolio. In her management role as an Associate Director (NHS Greenwich CCG), she leads on commissioning for medicines including pathway re- designs and for the financial monitoring of medicines optimisation budgets. Rena is also the Managing Partner of Hartland Way Surgery where her role as a Clinical Associate provides a platform for medicines optimisation. As one of the very few pharmacist partners in the UK, she has established that with appropriate training and entrepreneurship, patient care can be maximised by bringing a multidimensional professional overview. Rena is also a lead volunteer for BAPS National Women’s Forum (UK), affiliated to Shri Swaminarayan Mandir, (popularly known as the Neasden Temple). In her role as one of the lead volunteer, she supports outreach engagement programmes for the community. Rena is a recipient of many professional awards. 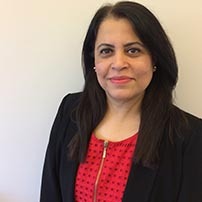 She was made a Fellow of the Royal Pharmaceutical Society, the professional body within UK for pharmacist for her outstanding contribution to the profession. In 2012 she was a recipient of Asian Women of Achievement Award for social and humanitarian category. She has a keen interest in training and mentoring, improvement in clinical outcomes and preventative strategies. Her strengths are in corporate management and improving primary care by appropriately collaborating with a wide range of stakeholders. Her volunteering role enables her to fulfil her passion for community enhancement programmes.